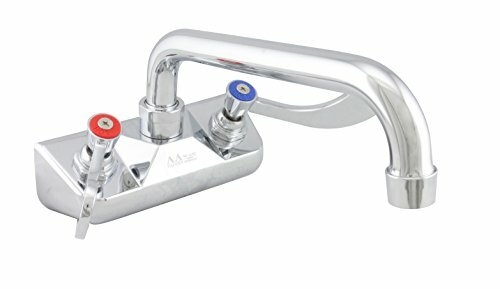 This AA-faucet wall mount lead free faucet is well designed and built for any working environment. While looking sleek in a polished chrome outfit, it features 2 color coded handles and a double O-ring swivel spout, which can direct hot/cold water to anywhere you desire. The heavy duty brass constructed body withstands both the heat and cold from the hot/cold water throughout the test of time. Heavy duty brass construction for durability. Polished chrome finish gives out a modern sleek look. Reinforced double O-Ring valves with hot and cold mark on stem. Compression nuts & washers attached. Color coded red and blue easy grip C-handles. Heavy duty double O-ring swivel gooseneck spout. If you have any questions about this product by AA Faucet, contact us by completing and submitting the form below. If you are looking for a specif part number, please include it with your message.